This is the fifth installment in a series based on a recent interview with NBA referee Bennett Salvatore. Go back to the first, second, third, and fourth posts for more on Salvatore. When fans complain about refereeing in the NBA, they complain about many different things. But there are two plays that stand out. Michael Jordan's name comes up the most, often in connection with the most famous moment in recent NBA history: his 1998 championship-winning shot, in which replays showed he shoved his Utah defender, Bryon Russell, to the floor without incurring any penalty. The other is the Dirk Nowitzki foul that sent Dwyane Wade to the free throw line with less than two seconds left in Game 5 of the 2006 NBA Finals. Both came up in my conversation a little over a week ago with NBA referee Bennett Salvatore. He made the call the against Nowitzki. And the other one? We'll get to that in a second. First of all, let's take a look at what happened in Game 5 of the 2006 Finals. When I bring up that night, Salvatore remembers it as "the call I was crucified by." What you see is, to my eyes, Dwyane Wade driving into a crowd of bodies and then missing a layup, which is followed by Salvatore calling a foul on Nowitzki with 1.9 seconds left. Wade makes two free throws, which provide Miami's final one-point winning margin, and essentially decides the game, if not the entire championship. People were livid about so many aspects of that play. Some time ago, I asked Dallas forward Josh Howard about it. You buy the theory that some kind of conspiracy involving the referees cost the Mavericks the Finals last year? I don't want to respond to that. I'll just say that everybody in the world knows we were supposed to be champions. Just for the record, if you don't believe it was a conspiracy, you can answer that question directly. Yes, throughout the history of sports, losers of big games have alleged terrible things about referees. Maybe that's all that is. Or maybe we need better information about what's really happening on the court -- to dispel false assumptions or expose mistakes that could be addressed. "My understanding from the rule book is, if you are going to catch the ball in the backcourt, you have to be in the backcourt to catch it," Cuban said. Not true, according to Rule 4, Section VI, which deals with frontcourt/backcourt. Replays showed that Wade leaped near midcourt to catch the ball in the air, landing with possession in the backcourt. Part of the rule states that, "frontcourt/backcourt status is not attained until a player with the ball has established a positive position in either half during a throw-in in the last 2 minutes of the fourth period and/or any overtime period." Because Wade was in the air when he caught the ball, league spokesman Tim Frank said his position wasn't determined until he landed. And since another rule allows for the ball to be thrown into the backcourt at that time, there was no violation. The biggest complaint, however, was the foul on Nowitzki. Salvatore called the foul on Wade's final drive in overtime (remember, the call where ABC couldn't find a replay to show that anyone touched him?) even though he was standing at midcourt a full 35-40 feet from the play, and even though two other refs were closer to the play. Not only was that NOT his call, he butchered it. Let's face reality: the Mavs played well enough last night to win 100-99 BUT FOR the fact that Wade went to the free throw line AGAIN when he missed what might have been a game winning shot. The Mavs defended him well, BUT FOR the fact the refs took it out of the Mavs hands. Ignore the officiating all you want. It just shows YOU are missing the story. I asked Salvatore about that trend specifically, and he said: "I can not be concerned, nor can any referee by concerned with the amount of times someone goes to the free throw line or doesn't go the free throw line. We can only be concerned with if the call is correct or not correct, because that's what our job is based on." A jumper by Dirk Nowitzki over Shaquille O'Neal gave the Mavericks a 100-99 lead with 9.1 seconds remaining. After a timeout, the Heat inbounded into the backcourt to Wade, who snaked through four defenders along the right side and drew a foul from Nowitzki. "It was like two or three guys coming at me," Wade said. "I was just trying to get a little space where I could use my quickness to get by them. Once I got by Jason (Terry), I was able to maneuver my way to the basket." ind of thought I went out of the way and they gave him the call," Nowitzki said. "So I thought it was a tough call." When the NBA agreed to let me interview Bennett Salvatore, they also volunteered the following video. There are cameras all over NBA stadiums at every game, and the league uses multiple angles to assess the quality of referee calls. This video is from the opposite side of the court from the network's cameras, the quality is excellent, and it's in super slow motion. Watch with an open mind. Watch closely. Watch several times. Get down there in the comments and tell me what you make of this. My second thought was: why didn't every TV network get a copy of this the day after the game? Why don't we get to see this kind of video about every call? Roll it one time watching nothing but Dirk Nowitzki's right hand. Then watch again, and this time watch Wade jump, shoot, and land. Everything about that motion -- the way the ball leaves Wade's hand with too much forward force, the way he lands stumbling, and the way Nowitzki's hand plainly shoves Wade -- it's all consistent with a guy who has been pushed in the small of the back while jumping to shoot. It's minor contact compared to a lot of things you see on a basketball court. But it's contact that makes making a layup nearly impossible. It's the kind of contact NBA referees are looking for. To my eyes, it's a real deal NBA foul. I watched it with Salvatore. Frankly, everyone in the room, looking at this video, thought it was a decent call. He added: "I want you to do one thing. Look at Dirk. Dirk knows that he fouled him. You don't see any reaction from Dirk at all. Dirk knew." So, I know you won't all agree, but from where I'm sitting, the worst call of Bennett Salvatore's career was good. Score one for referees, credibility, and the NBA. What Happened to Jason Terry? When I first watched the video, I had forgotten all about the particulars of everyone's complaints. I just watched it. And I was struck by Wade's shove of Terry. Nevertheless, to my eyes ... that's a foul. That was one of the things that Mark Cuban was really mad about after the game. "You mean when [Wade] pushed [Terry]? I don't know," Cuban said, ramping up the facetiousness: "I guess that's not a foul." This is my conversation with Salvatore as I played the first part of the video. He's backing up to start out with, in a defensive position. Salvatore was brushing aside the notion that Terry was shoved. What I was hearing was not squaring with what I was seeing. He is -- I don't want to get into how players play defense, and how offensive players do their things -- his momentum is actually taking him there. The outstretched arm looks like he's being pushed. But in essence, his defensive position is actually carrying him to that point, without the extension of the arm. Salvatore is a warm, personable, and funny man. He made a joke, when I first started showing him video. For most of our interview, we were sitting across the table from one another (flanked by the two NBA employees I discussed in the first post of this series). As he rose to join me looking at video on my laptop, he laughingly predicted what he would be saying: "Referee was right, referee was right, referee was right ..."
It was a decent laugh line. Salvatore had just admitted that he has made some bad calls in his day, so it seemed like of course he wouldn't really be whitewashing everything. But then we discussed three controversial plays, and in each case he explained that he had been right -- Latrell Sprewell hadn't called timeout, but other Knicks reportedly had; Boris Diaw, on the other hand, had not called timeout at all, per Salvatore. Fair enough, maybe he was right on both counts. But in the case of Jason Terry's collapse -- what he was telling me was simply not squaring with what I could see on the video, which I have now watched probably close to a hundred times. When I said "let's watch it again" to him, the unspoken addendum was "because surely if you watch this again you will not keep telling me that Terry fell because of his defensive stance." And I felt like I was getting the whitewash. Sliding quickly in a defensive stance is something that Jason Terry has presumably been practicing since the first time he put on a uniform. Left alone in a gym, I assume he can do it all day without falling down. A wet spot on the floor? That could topple him. Feet tangled with somebody? That could make a sliding player fall for sure, and some people see it on this play. But I went over that part of the video extremely closely. Wade's black shoes and Terry's white shoes are helpful in picking apart the pixels. Yeah, it's a little blurry, but I'm pretty sure I can see some court between their feet at all times. Complaining is for weenies. Not for one second am I interested in re-opening the floodgates of "we were robbed" diatribes from Dallas. The Miami Heat are the 2006 NBA Champions and what's done is done. I'm even open to the argument that you don't make that call. You don't want a tacky offensive foul in that moment. I can see that argument that the shove wasn't enough. But the argument that there was no shove? Really? What we're talking about here, in the big picture, is whether or not fans trust referees moving forward. That's the topic that was opened by the Tim Donaghy scandal, and that's the topic the NBA is presumably trying to close, in some small way, by making Salvatore available for this interview. And on that count, this play leaves a funny taste in my mouth -- and Salvatore's explanation makes it even worse. It makes me wonder if he is expressing his honest assessment of this or any other play. It makes me worry that perhaps, as someone who is plainly very respectful of his NBA superiors, he is speaking more like a loyal soldier and less like a truth-teller. It also makes me concerned about what works and what doesn't on the court. Watch the way Wade is operating on this play. His team is down one on what could be the last possession of the Game 5 of the NBA Finals. The series is tied at two game apiece. 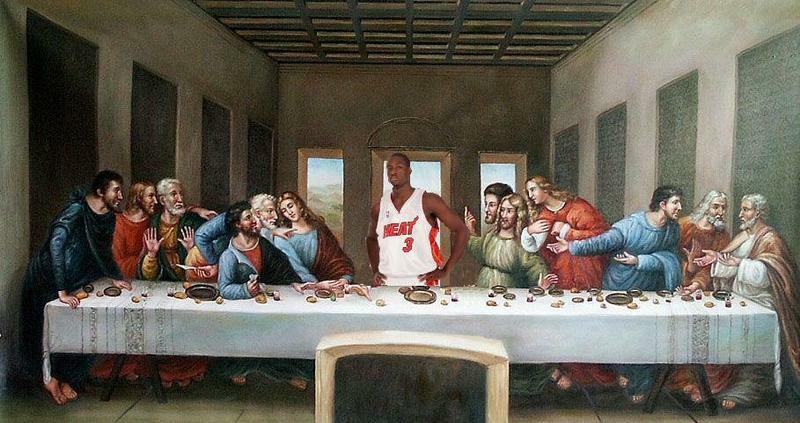 Wade must not make a mistake. A turnover, a foul ... even a miss would be disastrous. Yet to my eyes Wade is operating with impunity -- like a man who knows he is not going to be called for an offensive foul pretty much no matter what. He uses a guiding hand on the hip of nearly every defender he encounters. First Jason Terry -- shove or no shove, he's certainly putting his hand all over that guy's hip. Then here comes Devin Harris, who also gets some action from Wade's left hand. Then it's time to switch directions, and Wade's left hand has some tough-to-decipher contact with Josh Howard's hip that appears to send Howard toward the baseline a little harder than Howard intended. I'm not stupid. I understand that superstars on their way to the hoop in the closing moments of big games are the best thing that happens in the NBA. That's the moment -- as exciting as the league gets. Interrupting that with some minor offensive foul is a crime against, if not the game then at least the entertainment value, and by extension the economics, of the game. I have never understood the claim that the way the whole series was officiated was favoritism to Miami as part of some scheme to make Dallas lose. If you want to get calls from NBA referees, I remember writing at the time of the outrage surrounding this play, give the ball to a superstar and have him attempt magic. In that situation, in my experience, the referees smile on the offense. Which directly contradicts what Salvatore told me earlier, that no one gets special treatment, and referees just call the game the way they see it. Which is what fans by and large say they want. But I'm not sure that kind of impartiality is really evident in this video, and if Salvatore or anyone else from the NBA wanted to really impress fans, and build some trust, they'd admit to some high-profile bad calls once in a while. (Maybe this play isn't the one. Maybe the NBA really sees this play as well-called. Giving me this video in super slow motion is evidence that is so.) But there must be some high-profile calls that are wrong, right? I say get in the habit of 'fessing up. The Tim Donaghy scandal rocked the NBA's boat pretty hard. But the idea was that it was the kind of crisis that would inspire meaningful change, and a stronger NBA moving forward. It was a chance not just to deal with the issue of a single crooked referee, but also to install new systems, greater transparency, and to build greater trust between fans and the league. I see it as maybe trust in NBA referees was at a five out of ten at this time a year ago. And then for a moment it was briefly a two out of ten, thanks to Tim Donaghy. So now's the time to get it back to a seven or eight where it probably always should have been. Mark Cuban and David Stern -- two men who have disgreed mightily in the past -- were both singing that song this summer. We are going to, as I said, use the summer to analyze everything that we have, get the right opinions, and, you know, continue to improve our systems. Before I leave with a thank you, I just want to sum up to say to you that this is something that is the worst that could happen to a professional sports league. And I want to say on the other hand that we are going to make good on the covenant that we believe we have with our fans, and I pledge that my involvement will be as intense and complete as it can possibly be and what we do will be completely transparent. S--- happens. Bad s--- happens. When it does, there are two options. Cry over it and do nothing or recognize the problem and do the best you possibly can to not only fix it, but make the entire organization stronger. As bad as the allegations facing the NBA today are, it's also an opportunity to face every allegation that has ever been directed towards the NBA and its officials and pre-empt them from ever occuring in the future. The NBA took a hit today. Behind that hit is a catalyst and opportunity for significant change that could make the NBA stronger than it ever has been. It's a chance to proactively put in place people, processes and transparency that will forever silence those who will question the NBA's integrity. As someone who hears from a lot of NBA fans every day, I'm hungry for that new integrity and transparency, and I know I'm not alone! Maybe I'm too impatient, but I kind of thought we were going to get these kinds of things this season. What exactly? I want real evidence about which calls are good and which ones aren't. Even Salvatore has said that he thinks such a thing would ultimately be helpful. I want those new systems that everyone is talking about. Anyone know what they'll be? The first step, surely, is to hear the results of Lawrence Pedowitz's investigation, I guess. After that, whatever the NBA's cooking up, I hope it's good. Because so far I'm not sure anyone has good tools at the ready to silence those who claim that referees are incompetent or crooked.